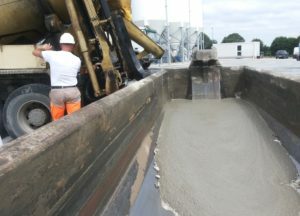 The recovery of concrete returns using the CEMBOX concrete tipper avoids dumping the washed out concrete in the settling tanks. The concrete washout increases the amount of scrap from the concrete plant. By transforming the concrete into mud for the settling ponds the amount of waste increases by 50%. Whereas using settling tanks in scrap treatment generates sludge, using a recycling station generates too much loaded water to efficiently manage. When the concrete returns are washed out no more, the amount of water in the concrete plants is limited to the concrete production and to the equipment cleaning. By limiting the facilities to only treating the concrete wash waters we come to rethink the used techniques. Since the amount of heavy elements increases, it becomes easy to purify the waste before the cement hardening. By rapidly eliminating a maximum of mud water produced by the wash water sedimentation we can obtain a hard stable material. By using this innovative technique the concrete plant produces no mud and no extra charged water. The clarified water is completely reusable in concrete manufacture since its rate of suspension substances is very low. The CEMBOX technique eliminates the costs associated to sludge production and to water addition during the production process. The patented design of the CEMBOX concrete tipper allows the reception of all the fluid hydraulic binders based products, including anhydrite.